It has been almost 60 years since the City of St. John’s adopted its first zoning by-law, and thirty years since the City’s first municipal plan was approved under the Urban and Rural Planning Act in 1984. Our existing municipal plan has been in place since 2003. 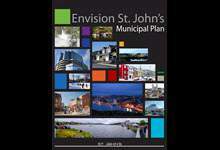 Envision St. John's was developed as a result of a comprehensive, an intensive consultation process and a new understanding of St. John’s today, and tomorrow. A capital that attracts and welcomes investment, residents and visitors from the region, the province and the world.